It would be terrible to live in Germany for four years and never make it to arguably the biggest event that Germany is known for. Oktoberfest. 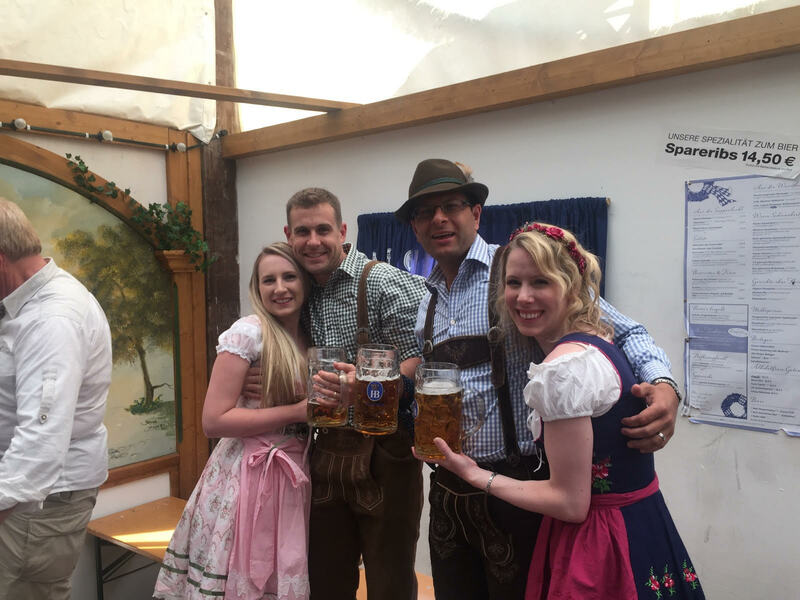 Every time I have said to anyone in New Zealand and Australia that we live in Germany, they’ve always asked, “Have you been to Oktoberfest?” Now we can say that yes we have, and yes, it’s as awesome as everyone imagines that it is! Planning for Oktoberfest began long in advance. I had tried to score us tent tickets early in the year but unfortunately, despite wording my email in German, we weren’t luckily enough to get any. A couple of months later, around March or so, I booked our hotel. Prices are ridiculous for accommodation during the festival in Munich so plan as far ahead as possible- even if it means booking things a year in advance if you know it’s something you want to do. As a once in a lifetime event though, it’s worth the cost and the prices make sense after our tour guide told us that Munich’s population more than quadruples during the fest season. Our journey began before the sun rose on a slightly foggy Saturday morning. We had purposely booked a specific train that only leaves once a day from Landstuhl as it went directly to Munich with no transfers. After some frustrations of having no seat reservations due to a train change, and an ensuing run in with some drunk Germans, we eventually made it to Munich. Usually most trains have seat reservations so this was just an unusual situation. We did end up with seats in another cabin and again we somehow unluckily ended up Eurotrip style. Note to others: always ensure that your seats are in an open cabin unless you really want to feel uncomfortable being in a small, quiet enclosed space with strangers. Particularly when they are speaking another language. We ended up with a one hour delay at the train station one stop out from Munich. Not speaking German, we had no idea what the announcements said and sat on the train along with the other Americans and foreigners while everyone else cleared out. As luck would have it, moments after the clearing out of the train, it ended up moving off and we made it to Munich with an empty train and a cabin to ourselves for the last half hour of our journey. A four and a half hour train ride turned into five and a half hours, but that seems to be the way things are lately. Our hotel was quite close to the train station so we were able to check in and wander the streets of Munich. The festival atmosphere was alive and well despite the dreary weather and everyone seemed to be in good spirits. We spent the afternoon eating, shopping and sitting enjoying the atmosphere. We had originally planned to do a free walking tour but our bellies were apparently starving and won out over the tour. Munich was like Berlin in terms of the shopping – lots of international brands like Abercrombie & Fitch, Urban Outfitters and some really quirky miniature IKEA – like places. I drove Nick crazy because we walked around one such place where everyone seemed to be a mixture of hipster/rich elite. I walked around and saw some ceramic cups that were shaped like crunched up plastic cups. I picked them up and said in a super posh voice, “Nick, aren’t these just DAH-LING!”. As we left I got up all close to him and with a plum in my mouth said, “Wouldn’t they just be the TALK of the PAH-TY! SUCH a TALKING PIECE!” I’m so embarrassing. We headed to bed after our really early start and partly because we wanted to be in our finest form for Oktoberfest the next morning. We were too excited for what lay ahead the next day! I had managed to book tent tickets through viator several months earlier. The tour I booked included tickets for the day reservation at the Hofbrauhaus tent, which included two 1 liter beers and half of a chicken. We were also transported to the grounds and taken for a tour that included the history of the festival and the grounds. Our tour departed by the gates set up for the Syrian refugee crisis. Interesting. Our tour group included a really big assortment of people. There were about 24 of us and although the majority were American, there was also a single lady from Paris and a family of an uncle, aunt and nephew from Spain. And me, of course, who doesn’t really belong in any particular group anymore. Our tent reservation was for 1200 and we walked around the grounds for an hour. It was much bigger and much more family friendly than I expected. There was a whole area of the festival grounds just for children. The whole place smelled like roasted, sweet nuts of various kinds. There was no fee to enter the grounds, unlike the usual A&P show in New Zealand, as it was meant to be for the people and accessible to everyone. It was kind of hard to tell that this was a festival for drinking during the daytime except for the fact there were several large tents. Each tent had horses that were drawing a sign saying the brewery name. The horses were huge and beautiful and if they were stopped, you were allowed to go and pat them. I thought that was pretty cool as usually in Europe people are very anti you touching their animals, despite having them out and about. I still don’t get that, but hey, probably some weird insurance rules. you love. Maybe he’s trying to tell me something! Haha. Either way, our tour guide told us that gingerbread is a very popular tradition as back in the old days they discovered that they could bake a bread that lasted for a long time. It was usual to bring back gingerbread as a treat from your travels. Legend has it though that you shouldn’t eat gingerbread given to you as a gift from your love. As we walked into the tent we could hear chanting from just outside. As we walked in, all you could hear was 10,000 people roaring as someone was chugging a beer. He was quickly ejected (but at least they let him finish it) for time to sober up. It was kind of surreal. I was raised in a town of 10,000 people and it was hard to imagine the whole town packed in one tent, all drinking beer! It was noisy, but not uncomfortable, and we quickly all joined in as soon as we had our first beers delivered. I went for radler, which is a mix of sprite and beer. It was easier to not get drunk that way, and I was able to stay buzzed all day just drinking those. Once we ran out of our beer tokens, a one liter of beer cost 10 euros. You are supposed to give a 20% tip – I’m not sure if that was our tour guide trying to make sure we got quick and fast service, or whether it’s required, but pretty much as soon as we handed over money the waitresses came to us with our beers. It is table service, so unless you are seated at a table then you can’t get beer as you have to have your drinks brought to you. This is the biggest dilemma of visiting Oktoberfest. However, I heard from friends that visited that they were able to sit at tables this year without much trouble. According to statistics, visitor numbers were down 10% this year which may have helped. Also, any backpacks had to be checked into a baggage check as due to security concerns this year no large bags could be brought into the tents. The lines to the bathrooms were long for women, as usual, but it actually ended up being pretty awesome. I met some cool people waiting in line, in the way that women always seem to become best friends while sharing their need for the toilet. I met a girl from Queensland, Australia who was really happy to hear that I had been to Brisbane before as apparently everyone she has met in Europe have always by-passed it. Alas, all good things come to an end and at 5pm we were swiftly removed from our table so that the night guests could come in and take up their positions at the table. I think the timing was probably pretty good though – we ended up leaving as people started getting rowdy and drunk. Oktoberfest was also getting a lot more crowded so I think going in the daytime is the best idea so as to not get involved in any unnecessary altercations. We met some really great people, a special mention has to go out to Samir and his wife Jenna who were from San Francisco – we had other plans otherwise I think we would have ended up hanging out with them all evening! High school is the most hated time in my life for a variety of reasons. I have pretty much tried to forget about it and in doing so it means I hardly have any connections to anyone from the high school I attended. One person I have kept in touch with as we have moved around the world is Julie. 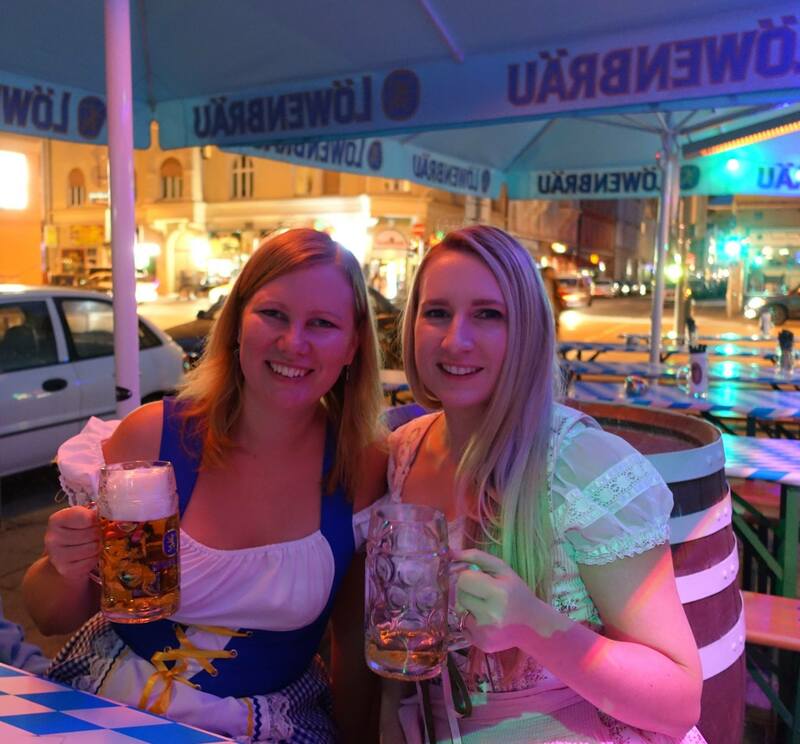 We just so happened to both be in Munich at the same time as she changed her travel plans around so that we could meet up for a Rangiora reunion on the complete opposite side of the world. It didn’t feel like almost 15 years had passed since we last hung out together at school. 15 years?! I can’t believe I am actually writing that, the time seems to go by faster the older you become – it’s kind of shocking. We had great discussion over beer outside of a dodgy pub on a dodgy corner of Munich, fending off drunk people and beggars. Julie has actually started her own business which is why she has been in Europe for the past six months. She is going to be offering rail tours around Europe. If you’re ever in the market for a tour guide, I can’t think of anyone better! We walked Julie back to her hotel and said goodbye, somehow I have a feeling we’ll end up seeing each other again soon given all of the travels she will be doing for her business. We then navigated through the red light district of Munich before heading back to our hotel room. Nick was a little worse for wear later that night – never underestimate how much alcohol is in German beer, especially in 4 liters of it! The next morning I was feeling great – 2 liters of radler wasn’t at all bad on my system. Nick wasn’t feeling so cheerful though! We almost missed our train because we read the schedule wrong, so we ended up having to sprint from our lunch to the train, making it by a couple of minutes. Lovely! The train ride was a lot smoother as we actually got an ICE train for once, which I’ve spoken about in another blog. We were in a quiet cabin which ended up being almost silent which was probably a lot of relief for Nick. As usual, things seemed to go a little awry. We were one stop out (again) and the ICE train kept stopping. It stopped over and over and they announced we were going to be late to our next stop. It was going to make us late for our transfer which would have meant we were going to sit for an hour at the next train station. I didn’t want to give up, so we stood at the doorway ready to run to the platform. 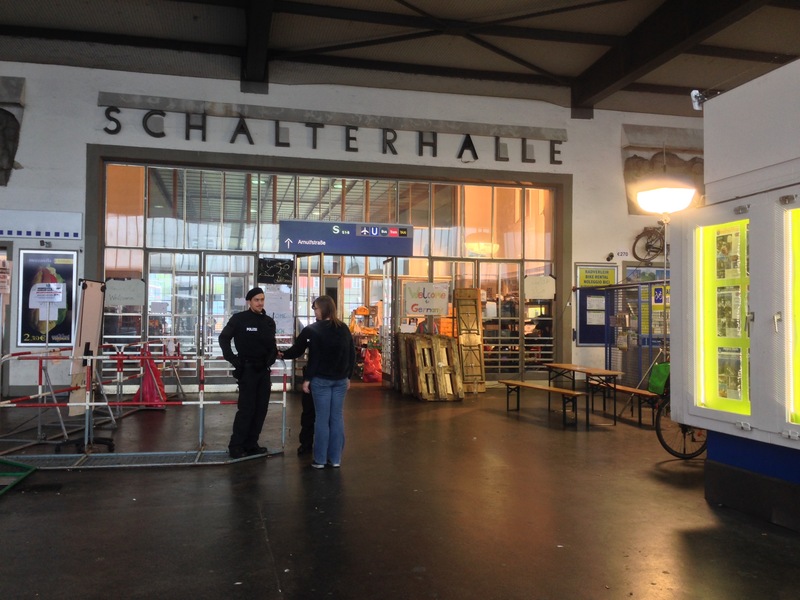 As it turned out, we made it and shared our train with a few Syrian refugees. It’s definitely an interesting situation in Europe right now. We have decided to avoid the train for awhile and just drive or take the plane as the trains seem to be getting held up a lot. All in all, Oktoberfest was absolutely awesome and it should be on everyone’s bucket list! I highly recommend going in the daytime just to avoid the dark side of drunk people. And, if nothing else, going to Oktoberfest will mean that you have the best German souvenir for future Halloweens – drindls and/or lederhosen! 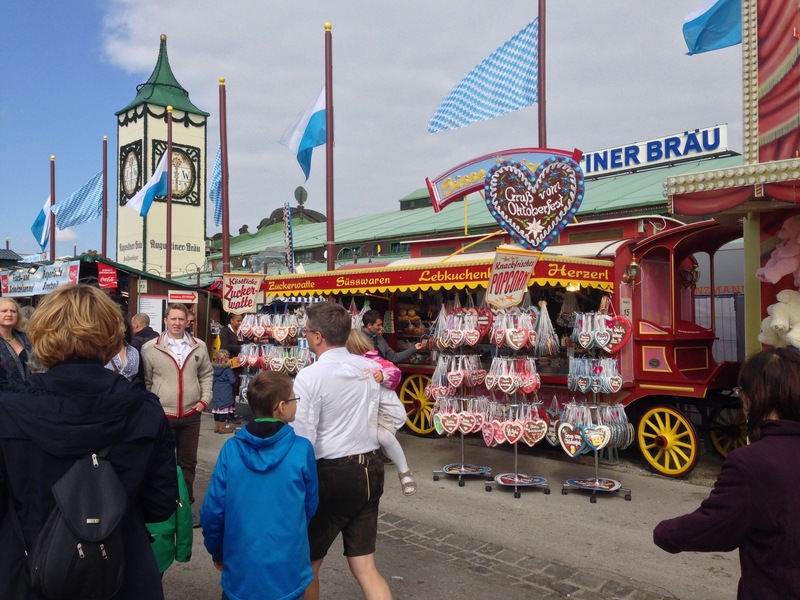 In my next blog I will talk about our following weekend to the Stuttgart Oktoberfest!